Two types of injury on young warm-season vegetable plants are caused by low temperatures: frost/freezing injury and chilling injury. Frost/freezing injury occurs when temperatures drop below 32°F. Ice formation in plant tissues cut cell membranes. When the tissue thaws, the damage results in fluids leaking from the cell, causing water soaked damage. 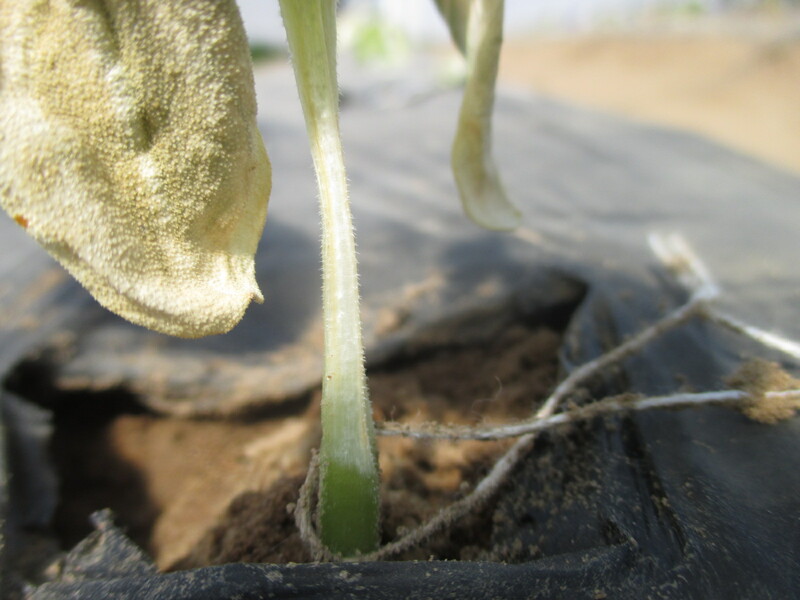 Frost/freezing injury is detrimental to warm-season vegetables, such as melons, cucumbers, tomatoes, peppers, beans. To avoid damage, the best way is to plant warm-season vegetables later in the spring, after the last frost has passed. However, weather is difficult to predict, and there is a growing trend of planting early to achieve early harvests. For the early planted warm-season vegetables, here are a few suggestions that may protect plants from low temperature damages. Covering. The idea of covering the seedlings is to create a microclimate around plants. Because the heat accumulated in soil irradiate back at night, covering maintains heat around plants, and creates a few degrees higher temperatures around young seedlings. Prevent covering materials from directly contacting plants. 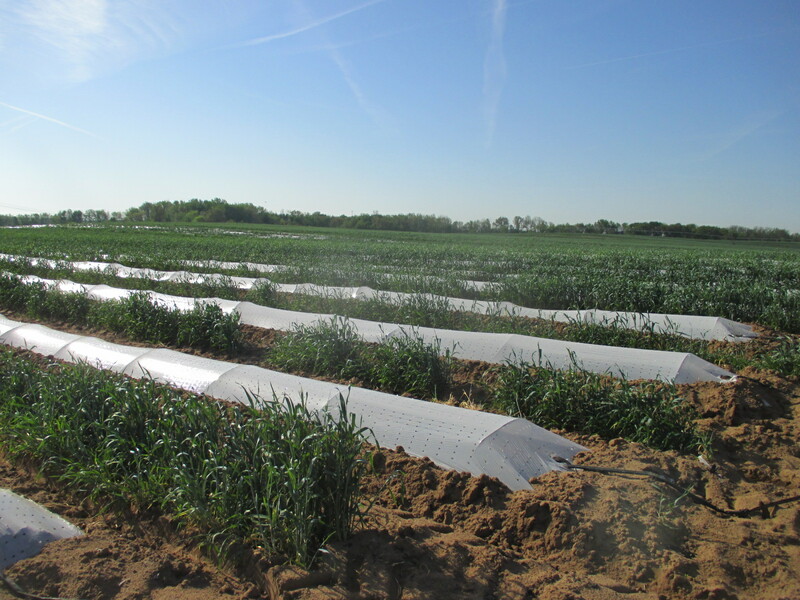 Using wire hoops create low tunnels and cover with thick fabric row cover for effective frost protection. If it is in the open-field, it is important to seal the edges of the cover to avoid wind blow. 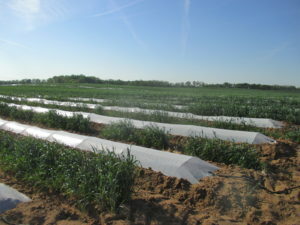 In large-scale production, low tunnels that are covered with clear plastic are used for early planted cucurbit plants in southern Indiana (Figure 1). On smaller scales, farmers may cover individual plants with styrofoam cups or plastic nursery pots. Styrofoam cups can be secured in position in the hole in plastic mulch. I also saw a field with young tomato plants covered with 1 gallon nursery pots and secured with a stone on top. Windbreaks. Windbreak play an important role in modifying microclimate. Daytime and nighttime temperatures downwind and near the ground, up to three feet high, tend to be several degrees warmer than unsheltered areas. Soil temperatures also tend to be several degrees warmer in sheltered area as humidity levels in sheltered areas increase that contribute to conservation of soil moisture and attract more heat. Windbreak is used on many vegetable production systems, and it is essential in watermelon production in southern Indiana. Winter rye cover crop or other small grain are used as the windbreaks. The winter rye may be sown in broadcast in the fall as a cover crop. Then tilled in spring for the watermelon crop, and strips of rye covers are left as windbreaks. Alternatively, strips of rye were planted in fall. The general idea is to space windbreak 12 ft apart for every foot in height of the windbreak. If the rye is 4 ft tall, rye strips are typically spaced around 50 ft apart. For early planted field, windbreaks are spaced closer, success was achieved by using rye strips between every bed of watermelons. Figure 1. Early planted watermelons covered with low tunnels. Note the rye strips were planted between every bed of watermelons. Hardening. Hardening is the process of exposing transplants growing in greenhouse environment to outdoor conditions. The process induces plants to accumulate carbohydrates, thicken cell walls, trigger root development. It helps plant withstand low temperatures, have less damage under chilling condition. Hardening typically start 1-2 weeks before transplanting. Move plants outdoors when temperatures are at least 45-50°F, and gradually increase the amount of time plants are exposed to outdoor conditions. Deep planting. The benefit of planting seedlings deeper in the hole is to prevent plants from having wind damage. This strategy can also help with preventing plants from low temperature damages. We saw this effect on cucurbit plants. Plants have a higher chance to survive when hypocotyls are buried in the soil, leaving leaves and growing points exposed above the soil. In this case, even leaves are damaged by the cold air, as long as growing point survives, plants may still recover. While if hypocotyls are above soil line, plants have little chance to survive if freezing damage occurred on the stems. Figure 2. The hypocotyl of a cucumber plant was damaged by low temperatures. Other considerations. For the earliest planted field, chose the field with the lightest soil as they warm up quickly. Avoid areas with frost pockets and shade. Lay beds and black plastic mulch as early as possible. The plastic should have excellent contact with the soil to help warm up soil. Firm beds and tight plastic help.